Being adventurous and working with livestock all around the world is something most people dream about, but Jake Zielke has made it into a reality. Join along with us as we tell about his adventures in this series; Jake Zielke- The Lost Cowboy. “This is where you get out.” The pilot said as he flung the door open of the little bush plane. The young American cowboy, Jake Zielke, could see there were no people and no buildings in sight. A dirt airstrip was the only sign that civilization had ever ventured into this vast, wild area deep in the Australian bush. As the sound of the plane disappeared into the sky, the young cowboy sat down on the ground beside his two luggage bags, as the silence surrounded him, Jake wondered what he had gotten himself into. Soon he could hear the rumbling sounds of an engine and as he looked up he could see an old Aboriginal man driving a tractor, who must have been doing some dirt work maintaining the airstrip. “Where ya headed mate?” the aboriginal man asked. It took Jake a moment to understand what the aboriginal man had said because he had an Australian accent multiplied by 100. Unfortunately, the man had never heard the name of guy who Jake was expecting to meet and neither one of the contact phone numbers he had worked. The aboriginal man said “Next plane comes in three days.” He got back on his tractor and left. As the sound of silence surrounded him again, Jake again started to question what he had gotten himself into. 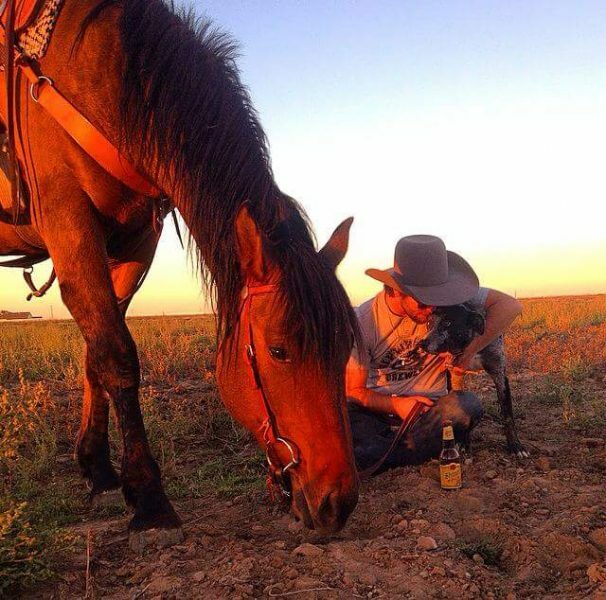 Earlier that year, Jake Zielke had been studying Veterinary Science and Ag Business at the University of Wyoming where he was enrolled in a few classes with a girl from Australia. Jake had mentioned that he would like to go work with cattle in Australia. The girl told Jake that her brother worked at a “mustering camp” and gave Jake her brother’s email. Email correspondence was very limited and basically all Jake had received in the return response email was a ten word reply with date and location to be if he wanted the job… so here he sat in what he had been told was Kowanyama, Australia. Unbeknownst to Jake, this would be the beginning of his adventurers working with livestock around the world. No trees to be seen, Jake had found some shade next to a bush, where he sat for a few hours until he could hear the sound of an engine again. A little Ute, diesel pick-up truck pulled up and two of the hardest looking guys Jake had ever seen jumped out wearing only short shorts, roughed up cowboy hats, and no footwear. “You the American, mate?” one of the men asked. Jake was relieved that someone had shown up to pick him up, and off they went. About another hour and a half farther into the wild Australian bush they drove up on an old falling-down tin building, some bull catcher trucks, and other machinery scattered about. Jake thought they were stopping to grab some supplies, but no, this was their camp. The shower was a hose fashioned in the corner of the building and was a known place for venomous snakes to seek water. Jake made his bed outside, but up off the ground, as everyone there had to sleep off the ground because of the dangerous snakes. Jake once asked what the plan was if bitten by one of Australia’s venomous snakes and the reply he got was “Find a nice place to sit in the shade and reflect on your life for your last fifteen minutes.” They were much too remote and the snakes were much too deadly. An interesting part of the bull catching was that it was on a piece of land that had hardly been touched in decades. Not only was it 50/50 cows and bulls, but the corrals, fences and all infrastructure was all but destroyed. They needed to make or repair everything they used. Jake and the crew used horses, dirt bikes, four-wheelers with bull bars and fully armored Toyota/Jeep buggies. They always had two helicopters hovering very close to the ground helping. All of this made it especially interesting, because Jake spent most of his time on a young, completely green horse who ended up throwing him once and sending him in a chopper to the hospital a few hours away. If it takes a few hours by chopper you can imagine how for it would be by road. Jake sums up his time in Australia in one word–“Wild!” His time was well spent working out in the bush and he learning all about how they used their land and raised their livestock in the vast, unsettled Australian bush. Jake had about two weeks until his flight was booked to take him home to the United States, when one of the guys he worked with asked “Hey Texas, would you like to go on a rodeo run?” And as luck would have it, they would be in the town he needed to fly out of around the time he needed to be there. Jake said he told his coworkers that he wasn’t from Texas, but the nickname had already stuck. Jake had attended the University of Wyoming on a bull riding/ rodeo scholarship, so he was no stranger to action behind the chutes. At the first rodeo they hit on their “rodeo run,” Jake’s buddy asked the stock contractor how much neck rein he should give his bronc. “X and 4,” the stock contractor replied. To which Jake’s friend said the cockiest thing Jake had ever heard behind the chutes… “I’ll give X and 1, and maybe a little more if he likes.” He said with a wink. Jake was shocked and as he helped saddle the bronc, he had doubts and worried that his friend didn’t know what he was getting himself into, and that he was probably going to get hurt. Then, as his friend started to climb over the chute onto his bronc the announcer said his name and started rambling of championships he had won all over Australia. He had traveled the PRCA circuit in the U.S. with other bronc riders such as Wade Sundell. Jake was kind of confused as his friend had never said anything about all of his saddle bronc riding championships. His friend tucked his chin and as he nodded his head he said, “Here we go Texas!” He rode the bronc like a pro, scored 88 points which 741won the rodeo and the next two weeks continued to turn into one of the most fun rodeo runs Jake has ever been on! Check back with us to read about Jake’s adventures in Argentina! Until then you can follow Jake Zielke on his social media pages and his personal blog.